Manchester United are out of the FA Cup following a 2-1 defeat at Wolves on Saturday night. The underdogs came out on top and deserved the result because they were more up for the tie. We never looked like we were going to get going at any stage and netted a mere consolation goal at the very end thanks to Marcus Rashford. So with United now out of the FA Cup, the Champions League is our only chance of winning silverware this season and it goes without saying that will be an extremely big ask! At Molineux, Victor Lindelof had been sent off for a wild challenge on Diogo Jota but it certainly wasn’t a red card offence. VAR saved the Sweden international and Martin Atkinson took back his red card and gave Lindelof a yellow instead. 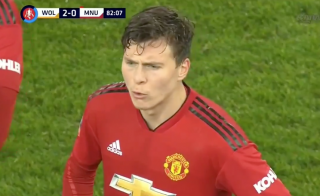 Atkinson initially felt that Lindelof had denied Jota a goal scoring opportunity purposely. The replays change his mind for the better and we avoided another bad call in the FA Cup during a weekend full of them! However, while they were making their decision with the help of VAR, Lindelof had a message for the Wolves bench. The influence of super-agent Jorge Mendes has brought a strong Portuguese contingent to Molineux – from players to manager – and Lindelof will know a few of them from his time at Benfica. We don’t know who this was specifically aimed at but Lindelof doesn’t hold back. United were already out of the tie at this stage, 2-0 down, so high tensions probably have something to do with Lindelof behaving in such a way.